With the General Data Protection Regulation (GDPR) coming into effect for all businesses who process the data of EU citizens on 25th May 2018, there’s a rush for businesses to quickly get their lead capture forms and landing pages compliant with the new policy. 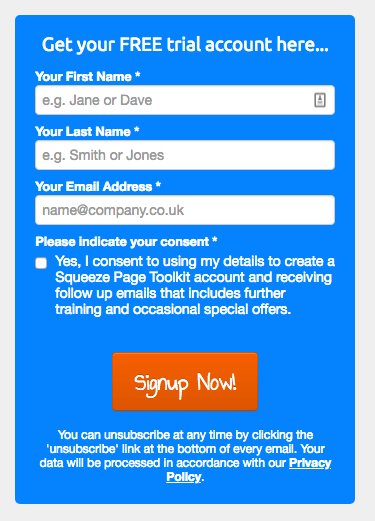 We’ve made some changes to the Squeeze Page Toolkit software to make it much easier to ensure that you’re compliant with collecting your leads. 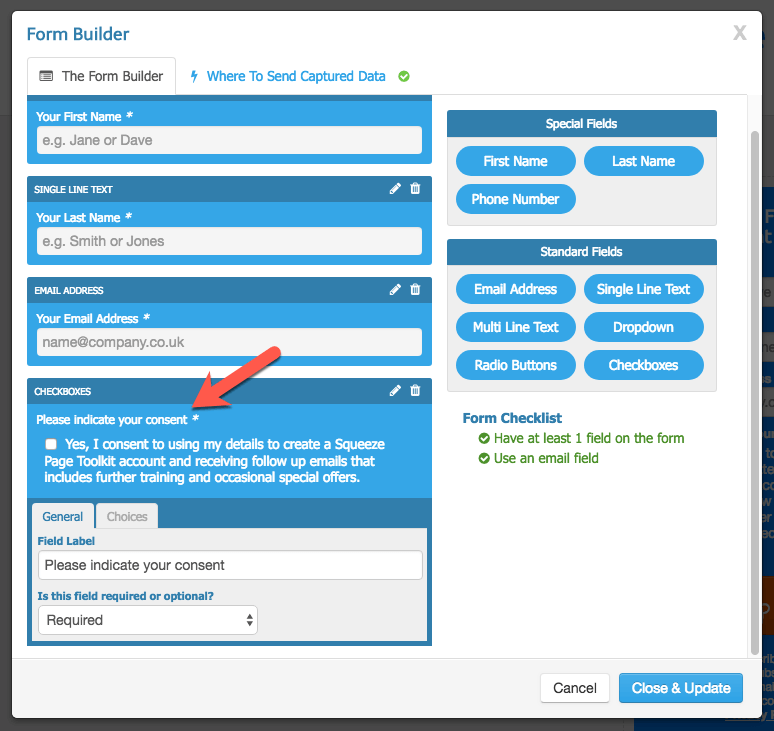 The changes have been made to our Form Builder (click the link to find out more about how the Form Builder works). If you’d like help with your GDPR policy templates, then UK small business lawyer Suzanne Dibble has created some excellent resources to help you become compliant. You can purchase her GDPR templates and guides*, which includes suitable privacy policies AND video training to help you ensure that your business is compliant. A big part of the GDPR policy is about getting informed explicit and granular consent from your prospects, so that they know what you’re going to do with their personal data (definition on ICO website is here). For landing pages and popups, the personal data we collect will usually include name, email address and telephone number. Since we’re then collecting email addresses to add someone to our email list, then we also need to get the prospect’s permission to allow us to continue emailing them. When GDPR talks about informed explicit consent, this fundamentally means that we need to make it really clear to a prospect that they are choosing how we can process their data. Or, when it comes to landing pages, they have to choose to receive emails from us. This means we cannot have pre-ticked boxes nor rely on implied consent for them to receive emails. 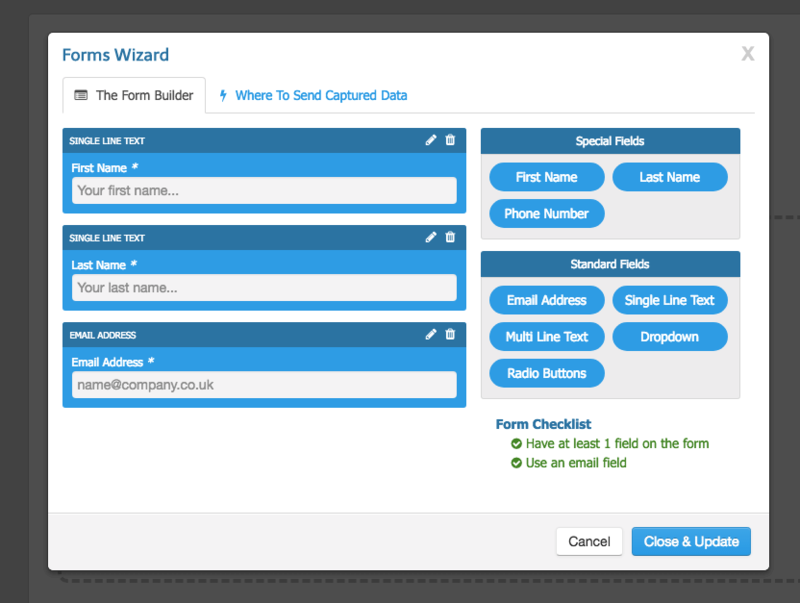 Using the Squeeze Page Toolkit Form Builder, you can add the following elements that helps a landing page become compliant. The exact wording you use will be up to you and your business. 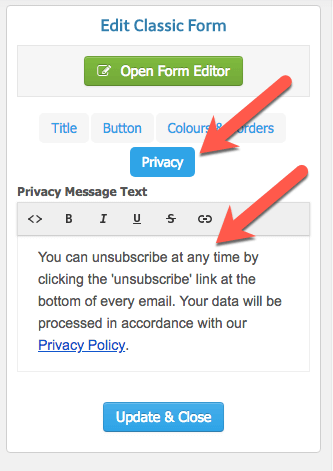 Typically you wouldn’t make the tickbox a required field as consent needs to be ‘freely given’, however, we have as we specifically need to send a few emails to a new trial account user so that they can use their account. This is why you need to investigate what you need to do for YOUR business that’s compliant with GDPR. 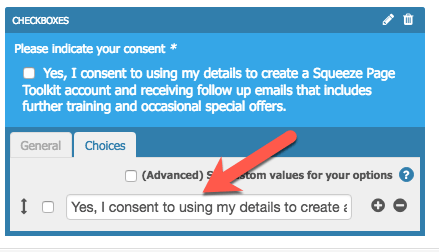 This is where you start breaking down what consent you want to request from your prospects, which means you might have more than one checkbox. 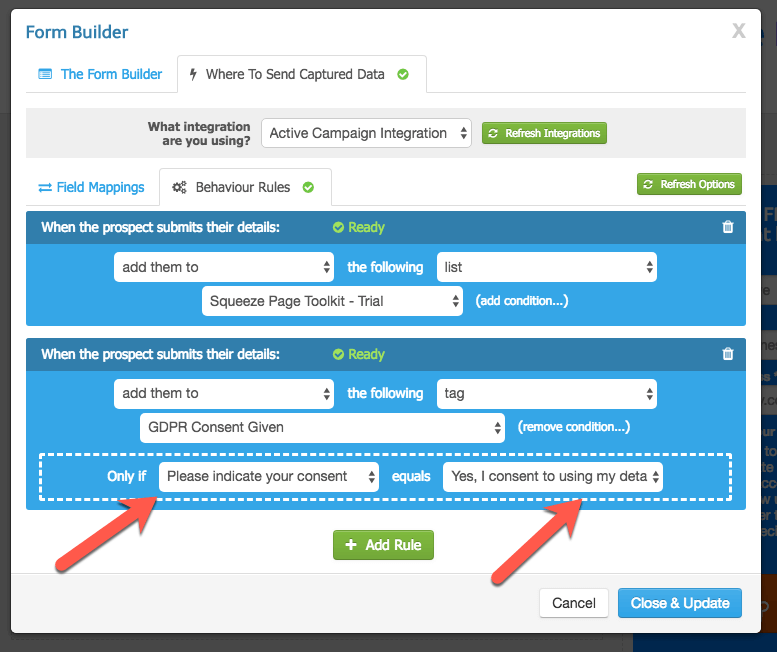 Or apply a tag (this is our preferred approach as you can do further processing in your CRM more easily). This is the version we’re showing below. Whilst we’ve made things as easy as possible, please feel free to contact the support team if you’re stuck. Unfortunately we’re not able to offer any advice on GDPR, but we can help with your landing pages and forms. We’ve linked to Suzanne Dibble’s free 2 hour training and template pack above using an affiliate link. If you choose to purchase the template pack from her, then we do earn a small commission. We strongly recommend Suzanne’s GDPR pack, as it’s comprehensive, informed and high quality. We’ve used her pack for our own businesses because it offers so much value.